This freeware program visualizes pathways (KEGG, BioCarta, GenMAPP, ...). 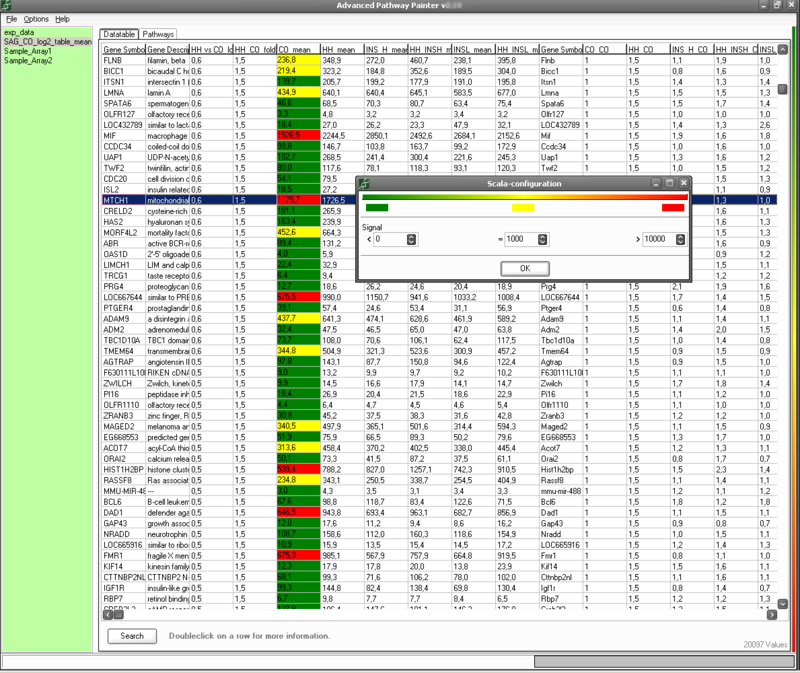 The user has the possibility to display any kind of quantitative data from gene and protein experiments directly within the pathways (colours represent the value). The linking between the pathway items and the experiment data is done over the gene or protein names and their accession numbers. Furthermore the user has a quick overview on the gene/protein with the collected links in the web-interface (direct links). This program includes only a small part of the functions from the software GENOM 2005. You are hereby licensed to make as many copies of the TRIAL VERSION and freeware version as you wish and distribute it to anyone provided that all files are intact. You must distribute the install form of the TRIAL VERSION (not the files resulting of an installation). You are not allowed to sell the TRIAL VERSION or freeware version (except for shipment and handling charges). Computer's Magazines are authorized to distribute it on any Cover Disk or CD-ROM without any permission. SOFTWARE LICENSE AGREEMENT This user license agreement (the "AGREEMENT") is an agreement between you (individual or single entity) and GSA, for the GSA software (the "SOFTWARE") that is accompanying this AGREEMENT. The SOFTWARE is the property of GSA and is protected by copyright laws and international copyright treaties.